Urban school populations are particularly diverse, requiring teachers to see to a broad spectrum of student needs. Latinos are the largest and fastest growing racial/ethnic minority group of students in the U.S., and the majority of Latino students live in urban areas. Data can be a powerful tool when used by teachers to target specific student needs, especially those of subgroups with a history of academic struggle. Latino students are commonly featured in not just one, but three large subgroups that typically struggle academically when compared to peers outside these subgroups: the Hispanic, Socio-economically Disadvantaged, and English Learner subgroups. It is vital teachers use data to better understand and meet these students' needs. However, such data use can only benefit students if teachers understand its meaning and implications. 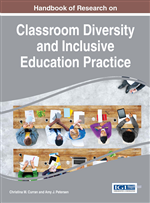 This chapter highlights study findings that can significantly improve teachers' ability to use data to help Latinos and other students in diverse classrooms. Urban school populations are particularly diverse, requiring teachers to see to a broad spectrum of student needs. Latinos are the largest and fastest growing racial/ethnic minority group of students in the U.S., comprising 24% of the U.S. children population, which will grow to over 33% by 2050 (Murphey, Guzman, & Torres, 2014). Conversely, according to a report from the U.S. Department of Education, National Center for Education Statistics other racial/ethnic groups have remained relatively stagnant (as with African American students) or are not growing as rapidly (Aud, Fox, & KewalRamani, 2010). Latinos are more likely to live in urban areas. For example, most Latinos (45%) live in urban areas, with 31% in suburban areas, 8% in towns, and 14% in rural areas (Aud et al., 2010). Latino students in the U.S. live predominantly in neighborhoods of concentrated poverty, where they are further faced with crime and poor housing, and facing threats to their well-being (Murphey et al., 2014). Data can be a powerful, pivotal tool when used by educators to target specific student needs, especially those of subgroups with a history of academic struggle (Faria et al., 2012). For example, in a two-year study involving 53 schools, well-implemented data-informed decision-making was found to have a significantly positive impact on students, equivalent to one additional month of schooling; gains were especially significant for socioeconomically disadvantaged students (van Geel, Keuning, Visscher, & Fox, 2016). Latino students in the U.S. comprise particularly relevant subgroups in this respect, as can be seen in 2013 National Assessment of Educational Progress (NAEP) results involving the testing of fourth and eighth grade students throughout the country (see Figure 1). The 2013 NAEP revealed an average of 21% of Hispanic students (the subgroup to which Latino students are assigned) were proficient in Reading, as opposed to 46% proficiency averaged by whites, and 23.5% of Hispanic students were proficient in Mathematics, as opposed to 49.5% proficiency averaged by whites (National Center for Education Statistics [NCES], 2013). When compared to students in the White and Black subgroups, Hispanic students are the least likely to be academically ready for kindergarten (ASCD. 2015). Hispanic students are also least likely to have a mother with a bachelor’s degree (11%) when compared to students who are Asian (51%), white (36%), black (17%), American Indian/Alaska Native (16%), or of two or more races (31%) (Aud et al., 2010). However, data can only benefit students if teachers understand its meaning and implications. This chapter will highlight current problems with teacher data use, as well as a cost-free, research based solution to misguided data use that can significantly improve teachers’ ability to use data to help Latinos and other students. Reference Sheet: Supplements each report to help users understand that specific report’s data. The reference guide is sometimes called an abstract or summary. This single page features the report’s title, description, image, focus (content reported), and warning (vital, cautionary information an educator would need to avoid the most common analysis errors made when analyzing the particular data being displayed). The sheet can also communicate the report’s purpose (key questions the report will help answer) and additional focus information (intended audience, and format in which data is reported). Data-Informed Decision-Making: The process of using data to guide decisions. When educators use this process, their decisions ultimately impact students and often impact other stakeholders, such as teachers and administrators. Data- driven decision-making is a more common term, but data- informed decision-making is a preferable term since decisions should not be based solely on quantitative data ( Knapp, Swinnerton, Copland, & Monpas-Hubar, 2006 ; USDEOPEPD, 2009 ). Report: An arrangement of data usually selected for a particular topic and purpose in order to communicate the data to a particular audience through graphs/graphics, tables, text, and/or other means. These data reports can take online forms such as data dashboards or can appear as traditional printed pages. Data System (within the Context of Education): A computerized system that houses and displays student, educator, and school information and allows users to retrieve, manage, and analyze the data. Examples of data systems include an assessment system, data and assessment management system, data mart, data warehouse, decision support system (DSS), information system, instructional management system (IMS), learning management system (LMS), special education system (SES), student information system (SIS), and other educational technology product types that contains a significant feedback component. Help System: A computerized, online collection of task-based lessons that walk data system users through sequential steps to accomplish tasks within the data system, as well as topic-based lessons that help users understand and use the data housed in the data system. User: Any person using a data system, such as within the field of Education, where this is likely an educator (including classified staff). However, in some cases the user can be a student, parent, or other stakeholder. Reference Guide: Supplements each report to help users understand and use that specific report’s data. The reference guide is sometimes called a data guide, interpretation guide, or interpretive guide. The report’s reference sheet (which is described below) functions as the guide’s first page, and subsequent pages contain the report’s instructions (how to read the report), essential questions (showing the user where to look on this report – and what to look for – to answer each question listed in the purpose area of the guide’s 1st page), and a “more info” section (offering where to get additional information on related topics). Over-the-Counter Data: Education data that is accompanied by usage guidance, embedded within the use environment, just as over-the-counter products are accompanied by embedded usage guidance. Data systems and reports can provide over-the-counter data by adhering to Over-the-Counter Data Standards ( www.overthecounterdata.com/s/OTCDStandards.pdf AU38: The URL www.overthecounterdata.com/s/OTCDStandards.pdf has been redirected to https://overthecounterdata.com/s/OTCDStandards.pdf. Please verify the URL. ) when reporting data to educators and other education stakeholders in order to improve their understanding and use of the data. These standards involve implementation of effective labels, supplemental documentation, a help system, package/display, and content. Footer: A type of data report label with data usage guidance, involving brief (such as one to three lines of) text at the bottom of a data report. Professional Development (PD): Continual process of learning recommended for educators. This process can involve a range of improvement strategies such as online networks, embedded videos, on-the-job training, traditional workshops, weekly collaboration sessions, and more.